I made this again…I just had to see if it was as good the second time…and girlfriend…mmmmmm,mmmmm,mmmmm. I truly don’t think this recipe got the attention it deserved the first time, so I am reposting, hoping you will give this a try. I must have an Italian gene somewhere…what is it about Italian food that just gets me? Tomato, cheese, pasta, bread….it is the very reason I cook…or eat for that matter! Making cheese has been on my bucket list for a long time…if I had any idea it was this easy, I would have done it a very long time ago. Once tasted, it will now be very difficult to buy in a grocery store ever again. Served warm it is out of this world. Not overpowering at all, just a nice subtle flavor. 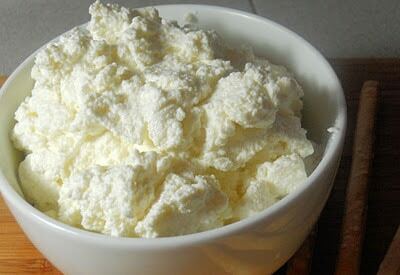 I could almost describe it as under whelming, it is smooth, creamy, rich and simple all at the same time. From start to finish the whole process didn’t take much more than an hour and most of that time is spent letting the cheese drain. 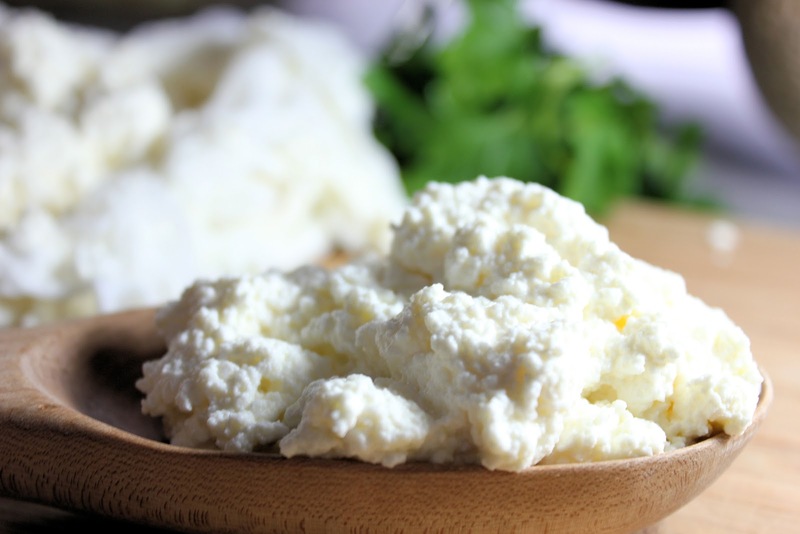 I read for hours, (literally), every recipe for homemade Ricotta that I could find on the web. I couldn’t find two the same. 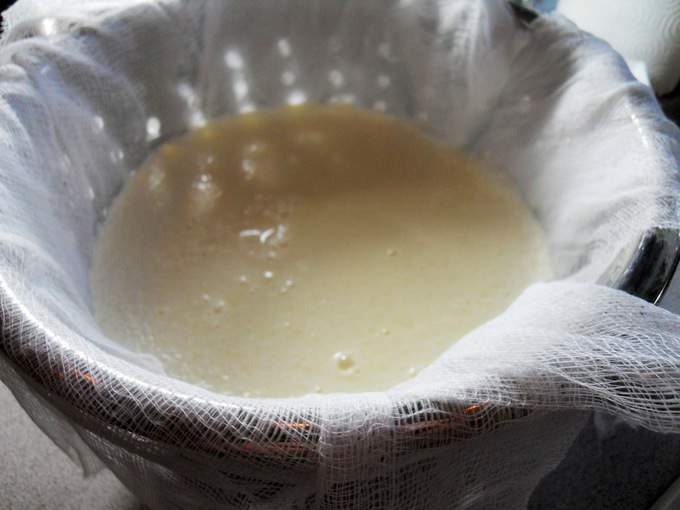 To curdle the milk some use buttermilk or yogurt, or lemon or vinegar. I couldn’t decide and I liked the idea of the lemon so I used lemon juice and also vinegar for an extra punch..next time I’ll try it another way…or whey …ha! I love cheesey humor! 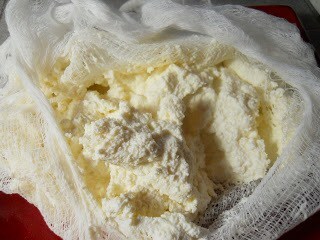 I’ll be using my fresh Ricotta tonite in lasagna rolls and I can’t wait! I was so tempted to whip up a fresh baguette this afternoon but didn’t, such discipline…am I skinny yet? I’ve listed the nutritional information and I think you will be pleased by the numbers. This will only last about 3 days in your fridge so eat it up or share with those you love! Pour milk and cream in large stock pot. Bring to a simmer on medium heat. Cooking thermometer should reach 190 degrees (or just before boiling point). 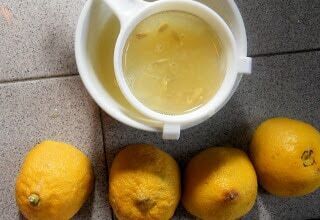 While milk is cooking juice 2 lemons and strain. When milk mixture has reached 190 degrees, remove from heat and add lemon juice, vinegar and salt. Continue stirring for 1 to 2 minutes while curds form. Allow to sit at room temperature for 10-15 minutes. Double line a colander with cheese cloth. 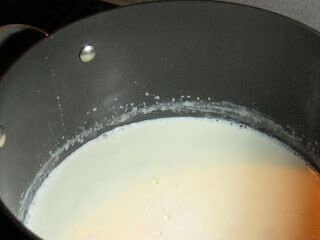 Pour milk mixture in to colander. Let drain for about 30 minutes…now there are many ways to do this and most folks just let it sit in the colander and drain…but not me! I read somewhere that you can tie it to your faucet and it will drain faster, so I had to give it a try! If you can get away with this without your family hauling you off to the foodie loony bin then I say give it a try! Either way you will have good results! When your Ricotta has reached desired consistency…remove from cheese cloth and store in an airtight container for up to 3 days. 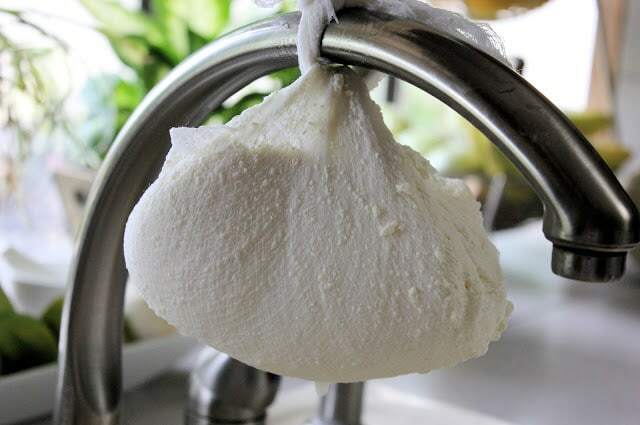 This is just the first of my cheese making endeavours…I can’t wait to try mozzarella…stay tuned! LOL yes I love your blog and CHEESY comments. You are a riot!